The Virtual Boy is a true oddity in Nintendo's history - though the company has acknowledged the curious system recently, it was largely ignored for years due to its status as the company's biggest ever flop. Never even released in Europe, it was undeniably a commercial disaster for the famous company. Yet in many ways it was ahead of its time, providing full 3D visuals - and its share of headaches - before the technology had truly matured. It's a system with a devoted group of dedicated fans, a number of whom port and create new games for the the most expensive eye goggles ever produced. The latest arrival is Snatcher, the cult-classic cyberpunk graphic adventure game written and directed by Hideo Kojima. 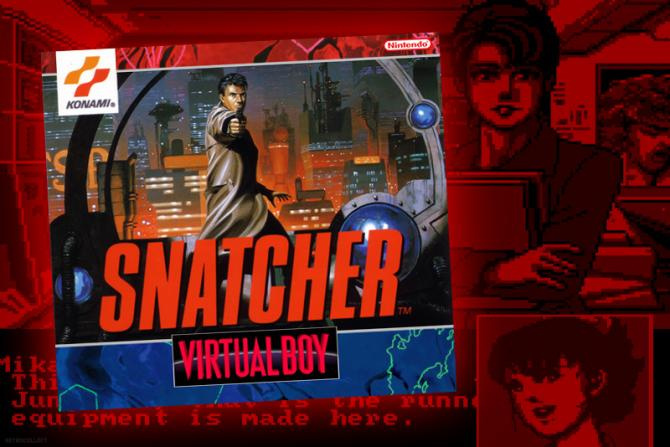 This title originally had versions on systems as diverse as the PC Engine and Sega Mega CD, but Planet Virtual Boy user Thunderstruck has now produced a demo of the early part of the game. With its static scenes it's a project well-suited to some retrospective porting, though it was undoubtedly still a challenging process. The ROM can apparently be played on the hardware using a flash cart, or through an emulator. Produced in memory of another Planet VB user that passed away recently, this is another example of how dedicated fans continue to keep the spirit of Nintendo's strangest system alive. There are Virtual Boy fans out there ? I wonder if it actually has any 3D effect added in that takes advantage of the fact the VB was a 3D display? I never did get my Virtual Boy back from my cousin. I'm sure it's stored away somewhere at his house. I should go get it sometime. Hats off to the people who did this for their departed friend. The fact that its a VB is irrelevant, whats important is keeping a memory alive through a selfless act. Very cool. @Einherjar Good for you. It's one of those games that I wish I could play again for the first time. Incredible story and plot twists. This is pretty stunning. Having been a Virtual Boy fan since its inception, I'm always amazed at the new software that is being programmed for the console. I'd love to see carts of these eventually sneak out and I'm still hopeful Nintendo sneaks the Virtual Boy library out to the 3DS. Is he going to uncensor it? At least those are my ethical standards regarding emulation. Support as much as you can, if you cant find the game anymore or are confronted with ridiculous prices, use it if those titles are old and out of print. Yeap, let us keep the Virtual Boy alive. Truth be told, I'm planning to get one soon and see if my adult eyes can handle it unlike me in my kid days. Somewhere Keith Apicary is giggling like mad right now. "In honour of a fellow Virtual Boy fan that passed away"
In honour of a fellow Virtual Boy fan WHO passed away! Pretty astounding, I have to wonder however if Metal Gear turns into a Virtual Boy at the end? Either way, SNATCHER is one of my favorite games and I wish we had a proper modern version that wasn't on such an obscure system as the Sega/Mega CD. A translated PlayStation port would be ace on the PSN. Yeah... I have a Virtual Boy in my basement. The 3D actually works pretty well, and the two games that I have for it (Mario Tennis and Red Alarm) are fairly decent. The down side is that the graphic give me a headache after and hour, pulse, I don't have a the stand for it so i get a neck ache too! It had Wario Land. It wasn't a complete disaster. Alright, time to bring us virtual boy games converted to 3DS and include this too! Back in the Holy Auwsome Bible of pre 20XX war Bill said "No way" and his brother by marriage of their former school mate, now legal guardian mom, Ted said "Way". Seriously I will buy this game when it is released inside of an case with booklet and artwork, I mean wow just wow. No really this is Solid Mojo on ice. Much better then an Cripple Fight between two paraplegics. This was a fantastic game on the Sega CD! This would REALLY be glorious if the Virtual Boy were not rushed to market, and was allowed to have a full color display. Still think it should have been a portable console that could just optionally plug into the 3D headset. Regardless, this is awesome! Kudos to them for crossing the tech divide in a fallen friend's honor! Thinking this is something from the game I missed? This is a fantastic game. I'm happy to say I have an original game disc for my Sega CD This gives more people an opportunity to play this amazing game! The real question is, is this going to come out for the 3DS?